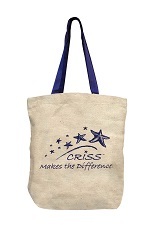 Celebrate empowered lifelong learning with Project CRISS goodies! Here’s the order form for what is currently available. Straps and design in dark navy. Specify logo or star design. Click to view six CRISS principles in the display window. Blue ink. 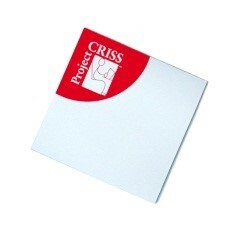 Red with yellow logo, “Project CRISS”, address, and website. Black ink. 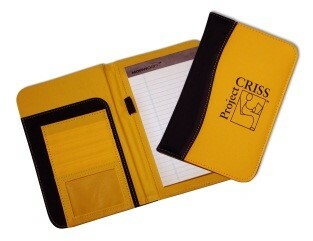 6” x 9” yellow with navy CRISS logo. Includes paper pad. Slots for paper, business cards, and pen. Opens flat. 10” x 12.5” navy blue with yellow CRISS logo. Includes paper pad. Slots for paper, business cards, pen. Opens flat. 13 oz. 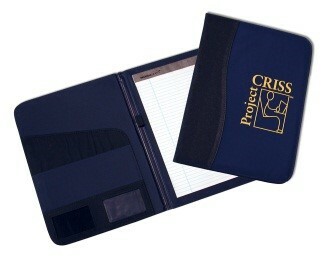 cobalt blue, clear glass with open book logo on front and Project CRISS and desk logo on back. 16 oz. 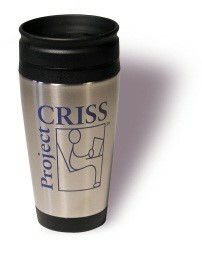 thermo-insulated with CRISS logo in blue. Fits in drink holders. While supplies last, we are discounting these items to clear the shelves! Call for info! 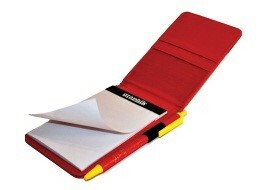 Red with black trim, white CRISS logo, paper pad, slots for cards. Opens flat.